My friend Aline took this photo in her wonderland of a garden last year. 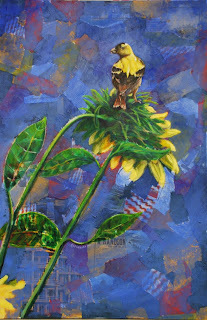 I finally got "a round tuit" and painted this goldfinch on a large, collaged canvas which had been languishing for just the right subject. The male American Goldfinch in its late spring/summer garb is a tiny splash of sunshine in swooping flight. It is hard to believe there is plumage so yellow in existence. Females, as is often true in the bird world, are much less showy in color, more of an subdued olive green. You can observe goldfinches at backyard feeders in much of the country. Aline captured a whole series of images, including one which has the little fellow, tail-up, rooting around in the head of the flower for just this seed! Although I do love this size to paint on, I have forbidden myself to buy any more canvas for this show. Six is what I have, so I will use what I have and make it work. Jerry's will just have to do without me for awhile! I talk with lots of people during my week at Libertytown. Many of them at this time in each semester come from the local community college where they are taking a Humanities class taught by one of our great supporters and First Friday regulars. She wants them to experience culture through a concert or live performance or trip to an art gallery or museum. She promotes our establishment, and lots of her students find their way through our doors. My artist in residence studio is right up front, off the main gallery. It is one of the first places many of these folks come. Their assignment is to find three pieces of art by three different artists that speak to them and are connected in some way. Then, they are to have a conversation with a live artist, which can be intimidating. In general, the questions are read verbatim to the artist off of the assignment sheet. To vary it, I try to answer the questions a little differently each time...How do you feel about your art? What materials do you use? But the question I almost always answer the same is: Where do you get your inspiration? I get the feeling that I am supposed to answer that some place or person or color or photograph gives me inspiration, and I am often tempted to say just that. But in all honesty, I don't really get inspired to paint. I go to work. I show up to the materials and get dirty. Fifteen or thirty minutes or an hour later, when I'm not really paying attention, inspiration comes. It's a shy creature. If I waited for it to approach, I would rarely create. In case I have left you with the impression that I find these conversations boring, let me assure you, first of all, that the learning is not one-sided. But my favorite part is watching the transformation. The students usually arrive hesitant, reluctant, shy, and ready to get this assignment over with. They, almost to a person, leave bright-eyed, enthusiastic, and resolved to come back and bring their friends and family. It's a flirty little thing, furled, having done the job of shading those who sat under it all day long. The umbrella may have completed its job, but I haven't finished mine. All that remains is for me to add the finishing touches. Thanks for looking. And welcome to my newest followers! Here's the latest, tenatively named Violet Sea. I am in a painting frenzy to the point where my blog has gone a bit quiet. Sorry about that! I'll show these larger canvases I've been working on as the days go on. I'll be better about checking in at your blogs, too. 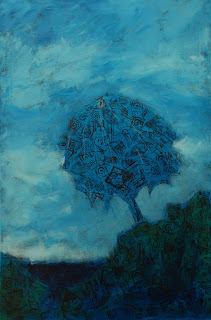 Getting to look at the interesting, imaginative new work currently on your easels inspires me. I enjoyed painting the triptych of trees (the link shows the golden panel) so much on those narrow canvases, that I wanted to try it on a larger scale. This piece is on 18 x 36 x 1.5 canvas. I plan to push the darks on the tree and the lights in the background to separate the two. It's kind of cool to see the spirals floating on the surface of the painting, but a little-crazy making! Tonight we open the new show at LibertyTown called Young Fredericksburg. The opening was postponed from the real First Friday when a snow storm blew into town. We are a little superstitious about First Fridays in Fredericksburg, since we have had blizzards, microbursts, hurricanes, flash floods and torrential downpours which all waited until that day to arrive in our fair city. Or maybe artists just have a persecution complex! At any rate, the sun is shining and is purported to do that ALL DAY LONG. We love the sun. This weekend I will be catching up on the blogs of my friends in the blog-o-sphere. See you there. I've had a nice bunch of time to paint, since we've had back-to-back snowfalls which kept me from getting in to LibertyTown. Pure bliss! It may be hard to see in the original image, but the printed under painting is still visible as the spokes in the orange umbrella. Someone asked me where I got the image, and I had to confess I made it up. I "saw" the umbrella shape in the under painting and went from there. Or perhaps I should say, it is a compilation of lots of images I've seen in my life and a wish on canvas of a place I'd like to be. Imagine me doing a happy dance, waving my paint brushes about at seeing my 150th follower! I have declared finished (for now) the eighth and final of the 6 x 18 canvases, five of which have trees on them. Here it is in a previous post. The underpainting was done in cobalt blue. I'm really happy with the patterns of the overlaid block prints. It is almost like mosaic or cloth. Besides cobalt blue, my palette included quinacridone nickel azo, quinacridone red, phthalo turquoise, titanium white and a black I mixed using phthalo blue and burnt umber. I used essentially these same colors in some combination in all eight canvases. I did also use prussian blue in a few of the paintings. I have loved finding all the beautiful colors that can be mixed with such a limited palette. An article for which I was interviewed was in our local paper yesterday. They printed color reproductions of the work of several of the participants in Arts Healing Journey, including my peacock painting, otherwise known as When Cultures Collide. I'm including it here. I hope you will take a look at the article. It is a great idea--a traveling art show organized by Hospice and celebrating the healing properties of art. It was a pretty big day, all in all, because when I checked the website of the Fredericksburg Center for the Creative Arts, I found that they'd used my image of My Other Car is a Jaguar for the postcard and flier. I want to extend a warm welcome and big thank you to my newest followers. Please let me know what you're thinking by leaving a comment. 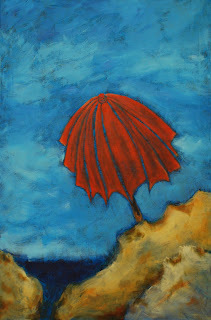 To continue the theme of warmer weather climes in the face of winter's onslaught, here is the third in my series of small beach umbrella paintings. I also bought some 18 x 36 inch canvases which will be their own series of umbrellas on a larger scale. Short post today. The day got away from me, and it's time to eat and go to a meeting. Thanks for landing for a moment from the blogosphere to make a comment.